← Cyprus: a test for different kinds of currency? 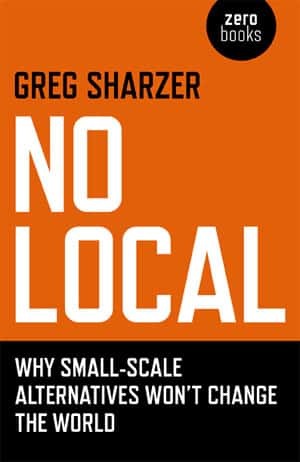 No local: Why Small-Scale Alternatives Won’t Change the World, by Greg Sharzer, Zero Books, 2012. This post was stimulated by a review of this book by Michael Ware, on a website called Climate & Capitalism. It raises interesting points with which I both agree and disagree. He characterises localism as “Start small and stay close to home; forge community ties, grow your own food locally, and create alternatives that can eventually replace the current system of global capitalism with a sane, sustainable way of life.” Most of the argument of book and reviewer is that localism has no hope of replacing global capitalism. Well, I agree in part. I agree that the local alternatives promoted by the Transition Network especially, or the Post Carbon Institute and others, for example, are highly unlikely to grow smoothly and gradually, until everyone sees them as the preferred alternative. (Whoever said they would?) Our current economic and political systems have far too great a hold on the minds and ways of thinking of most people, and are far too well defended socially and physically for that. That is not to say that localism isn’t important, even vital. In a recent blog post “Do the earliest mammals have lessons for sustainable societies?” I relayed evidence that the early mammals, who lived before the dinosaurs went extinct, were very different from modern mammals, although they were ancestral to them. Similarly, the localism we are developing today may be ancestral to the social and political structures of a sustainable future, but will not be the basis for them. They are vital in pioneering the community-oriented, collaborative structures we will see in the future. 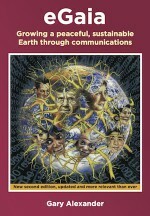 I argue in my book, eGaia, growing a peaceful, sustainable Earth through communications, that the future sustainable society will be locally-based, but globally connected. It is not the vision that Ware caricatures as “Localism seeks a return to a preindustrial economic model that romanticizes small-scale production” although perhaps that is close to what some of us thought in the 1960s and 70s. There are many benefits to large-scale organisation, in terms of sharing resources and best practice. There are appropriate scales for production to optimise resource use and community benefit, and some will be very local (most food and energy), others may be regional (some manufacturing, some energy), while a few that require very expensive specialised facilities may be global (computer chips?). We have very few models for decentralised but connected, collaborative enterprises. Large co-operative groups such as Mondragon in the Basque country may point the way. (And see Yes, there is an alternative to capitalism: Mondragon shows the way). Developing ways for our local projects to link and support each other seem to me the next step for us, and point to a future sustainable society. Such frameworks as Stafford Beer’s Viable Systems Model (and see Jon Walker’s slide show explaining it) or holacracy or sociocracy may be useful. I don’t see the transition as a smooth one, but as one which will take place on the wave of dissolution of a global financial crash. This isn’t a ‘come the revolution’ argument that people in the late 19th and early 20th century would have used. It is only now that we are reaching the limits of the Earth. We are witnessing the early stages of the collapse now. We don’t need to put our energies into helping or pushing that crash. Far better to build the community-based structures that will enable us to survive when it comes, and which will make it smoother and less traumatic for all. Also, I wouldn’t describe our problems as stemming from ‘capitalism’. After all, the review is in a blog called Climate & Capitalism. Capitalism is a relatively recent phenomenon, and has changed radically, even through my lifetime, to its present globalised form. In my book, I argue that the root problem is in the disconnection of people from the natural world and their communities, which has taken place in spurts over thousands of years. The No Local book claims that the only real alternative is ‘class struggle’ and the reviewer agrees. This is perhaps where I part company most strongly. Both book and review accept the Marxist views of class struggle: that there are the good and the evil people, that the evil ones must be removed, and the only way to do that is by confrontation. I think of the few young people I know (children of my friends) who have chosen to become bankers, or my friend who helps buy and sell companies. Evil people? Certainly not. They are intelligent, very able people who are part of a culture that says making lots of money is the major goal in life, to feed a high consumption lifestyle. I remember reading about the crash of the Icelandic banking system, and how it freed up lots of bright, talented people to work in more socially constructive ways. It is not the people who support the current economy who need to be the target of our campaigns for change, but the ideas and social structures they are caught up in. Some of those people may become our sustainable society’s greatest social entrepreneurs, once conditions and visions have changed. 1 Response to ‘No local’ – Can small scale change the world? Is it the alternative to capitalism? Right! Only the most bigoted lefty wants to actually physically eliminate ‘bad people’, although at times it is hard not to want to see particularly nasty individuals get their come-uppence ( ten years community service might do it). But mostly its the system not the individuals – as Catholics says hate the the sin not the sinner!